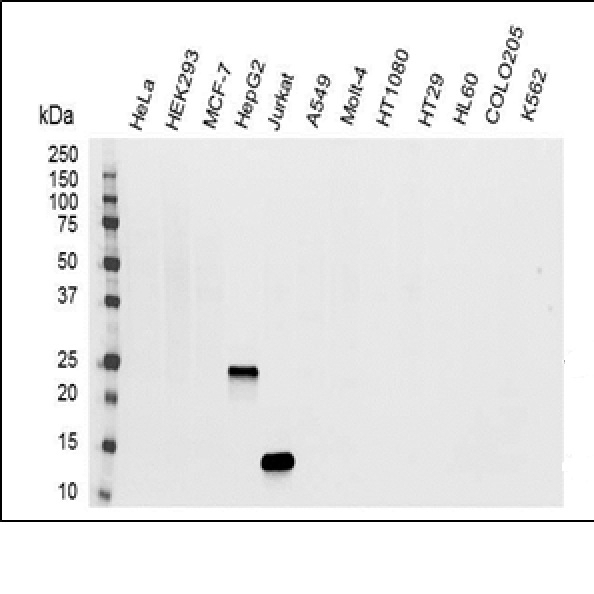 Mouse anti Human Interleukin-32, clone B08-3A9, recognizes human IL-32, a 26 kDa cytokine. There are four known isoforms of IL-32, IL-32α, β δ and γ. IL-32 activates NF-kappa-B and p38 MAPK cytokine signaling pathways. IL-32 has a pro-inflammatory role in innate and adaptive immune responses and is produced by mitogen-activated lymphocytes, IFN gamma-activated epithelial cells and IL-12, IL-18, IL-32-activated NK cells. IL-32 is expressed at elevated levels after the activation of T-cells by mitogens or the activation of NK cells by IL-2. Among its other effects in innate immunity are the induction of the crucial inflammatory cytokines TNFα and IL-6. and it shows elevated levels of expression in various inflammatory autoimmune diseases, certain cancers, as well as viral infections (Kim, 2014).